We now offer a one day refresher course that can accommodate more attendees. Want to Get Your Organization or Team to Perform Better? Regardless of the industry you’re in we grapple with leadership issues everyday. How do you get the most from your team? How do you position yourself and others for success? Where are you headed? Al is now available for speaking engagements. 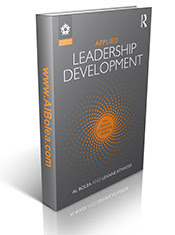 to help you progress on your journey of leadership and help your team do the same. Of all the leadership skills that I teach in my seminars the one that is often most elusive for attendees is empathy – the power of understanding and imaginatively entering into another person’s feelings. Last week I had a seminar attendee, Allyson, say to me, “Al, the truth is that I just don’t care enough about other people.” That was followed by, “… it feels awkward and I don’t know what to say, so why push myself?” I have received similar comments from both men and women. It’s a bit of a conundrum, isn’t it? You must have empathy in order to enter the leadership space, but it’s something many people are uncomfortable with. So, do the people like Allyson just give up on becoming a leader? I was reading an article in The Wall Street Journal (“Why You Should Have More Empathy,” Elizabeth Burton, May 2, 2016), and I found a new and helpful insight. The author described “empathic effort” as something different than “empathic accuracy.” The former is about showing emotional support to another person while the latter is about being correct in identifying a person’s emotional drivers. Maybe we can remove the burden from ourselves about being accurate and just put in the effort. That would surely help with the development of relationships. We do an exercise in the leadership seminar where one person talks for 90 seconds and another person just listens. I tell the listener that at the end of the 90 seconds they must be prepared to paraphrase for the talker what they just said and then describe how the person felt when he/she was talking. It’s always amazing for me to watch people do it. That is, how someone who is often a perfect stranger can listen so intensely that they can describe the other person’s emotion to them. Often the experience pulls at the talker’s heart strings and a tear is quickly wiped away. The point is that it makes no difference if the listener is accurate or not; it’s the fact that they made the effort to listen to the other person without judging them. That’s the “empathic effort” in action. • Deliberately suppress your judgment about a person when talking/listening to them. • Listen with your ears and eyes. Make repeated eye contact with the person. Listen so that you can paraphrase what you heard. • Acknowledge that person by saying to them how you think they felt in the moment. Don’t worry about being accurate; just put in the effort to show them (fake) that you are interested. • Don’t burden yourself further. This is about validating another person, not becoming their friend or trying to fix them.